You work hard at home to take care of your teeth. You brush every morning when you get up and right before you go to bed. You floss. You rinse with mouthwash. But what about the time in between? You spend several hours at work each day, and chances are that you eat lunch, and possibly a few snacks, while you're there. Allowing everything you eat to linger on your teeth for all of those hours can raise your risk of developing oral health issues, such as tooth decay and gum disease, even though you care for your teeth at home. Here are a few tips for protecting your oral health while you're at work. Or, if you work in an office, store a spare at your desk. You might feel a bit strange brushing your teeth in the employee bathroom at first, but you'll get used to it. And your teeth will thank you for scrubbing away leftover food particles and any plaque that may have built up. 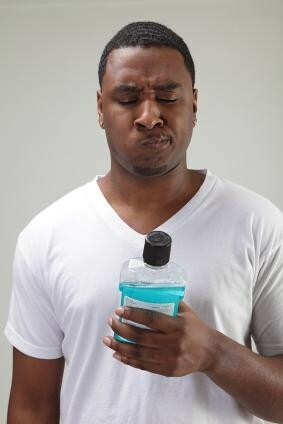 If the idea of brushing still doesn't work for you, at the very least have some antibacterial mouthwash on hand. This will help to kill any bacteria that have taken up residence in your mouth. It also helps to keep your breath nice and fresh, which is especially useful if you opted to eat anything containing garlic or onions. But not just any gum. Opt for the sugar free variety. Chewing stimulates your saliva production, which helps to naturally kill bacteria. Bonus points if you choose a gum that has a nice, minty scent. Offices are notorious for bringing in goodies like donuts, muffins or other sugary sweets. They make nice treats. But these snacks can destroy your teeth if you're not careful. If you want to avoid temptation, bring is some of your own snacks. Foods like apples, carrots and celery are all great for cleaning your teeth. They require quite a bit of chewing, which, like gum, stimulates your saliva production. They are also hard and crunchy, which means that they scrub plaque off your teeth as you chew. Don't let time at work ruin all of the work you do to protect your oral health. With the proper preparation and planning, your smile will be healthy and dazzling at all times.